The 34DD Full-Body Add-On Set #3 includes 3 outfits each for the 34DD-natural and 34DD-enhanced sizes, in all hip sizes 34 thru 40. 34DDe-40 and 34DDn-36 sizes are shown in the screenshots. These were made using Warlokk's Poser Magnets so as to conform to his Bodyshape Project Sizes. 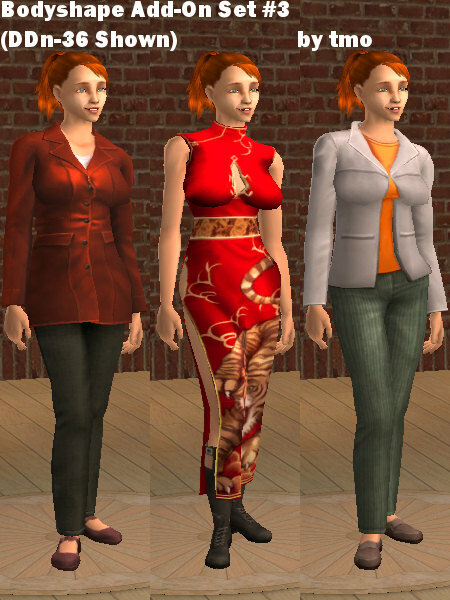 Included are the Leather Jacket, KT Dream Dress, and the High Collar Jacket outfits and meshes. Everything is an everyday outfit. The KT Dream Dress is also formal. The jacketted dresses are unavailable for these sizes as the magnets do not play well with the meshes and after hours of trying to adjust them (both base and final) in milkshape to no avail, I yield. Sorry. Each file contains the three meshes and 3 outfits for that particular size, and each outfit has an added pregnancy morph based on my upcoming v2.0 Adult Female Preg Morph Default replacement set, which better approximates the Maxis pregnancy belly and includes a breast swell.